Tarpon Springs is a small city of slightly less than 25,000 people on Florida's west coast about 30 miles northwest of Tampa. The main north-south thoroughfare is Alternate US-19, known locally as Pinellas Avenue. The historic sponge dock area is a popular tourist attraction located along the Anclote River west of Pinellas Avenue. It is also a working waterfront that's home to the remaining sponge boats and the large fleet of shrimpers. 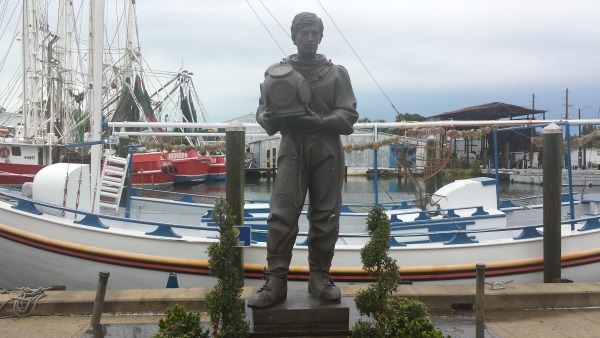 John Cheyney founded the first sponge business in Tarpon Springs in the 1880s and it provided quite a few jobs for the local economy. The sponges were harvested off the bottom of the Gulf of Mexico using surface boats and long poles to bring up the sponges. In 1905 John Cocoris came to town and introduced sponge diving to the industry. This deep sea diving technique used a special suit and a diving helmet with air pumped in from a compressor on the boat. 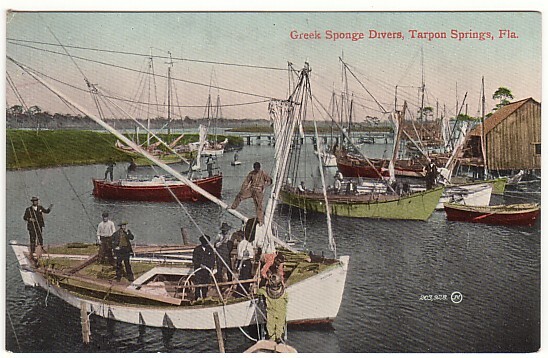 He brought in divers from Greece and the sponge industry soon became one of the biggest businesses in Florida and required more and more divers. Many of the original divers came from the Dodecanese Islands of Kalymnos, Symi and Halki. The street that runs along the sponge docks on the river is named Dodecanese Boulevard. Tarpon Springs now has the highest percentage of Greek-American citizens of any city in the United States. The area along the sponge docks is an interesting tourist destination with hundreds of shops, bakeries, restaurants and other businesses with mostly Greek themes. It somehow comes off as more than your average Florida tourist trap because of its sprinkling of museums, statues, plaques and other reminders of the area's unique history. Not only that, the locals are abundant in the neighborhood and you will hear a lot of Greek being spoken. It's a great place to have appetizers at one restaurant, then another appetizer at a second and an entree at a third, followed by baked goods and wine or coffee at yet another. There is something for everyone on Dodecanese Boulevard - even an abundance of sponges. There is an entirely different world when you get a few blocks away from the sponge docks and Dodecanese Boulevard. 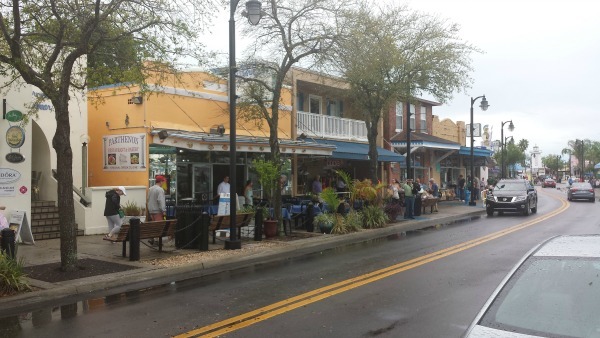 Tarpon Springs has done a great job of preserving many of its historic homes and institutional buildings. It's fun spending most of a day just wandering around the streets in the bayou country on the south side of the Anclote River. 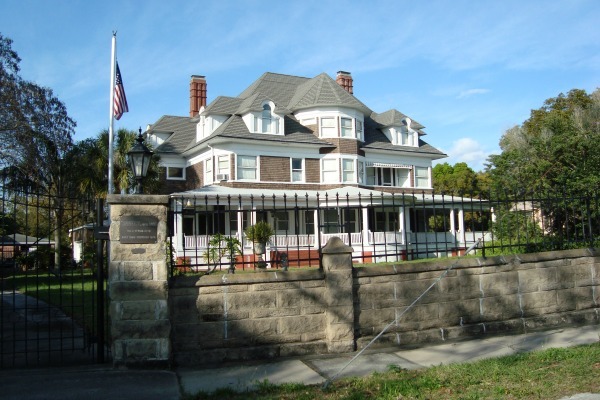 Although there are many new homes on the bayous, the city has established several historic districts within the city limits and you will see many well preserved old buildings. 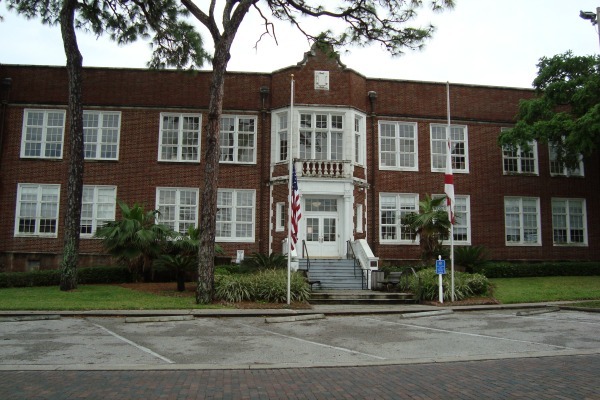 Several sites in Tarpon Springs are listed on the National Register of Historic Places, including the Old Tarpon Springs High School and the Old Tarpon Springs City Hall. There is a vibrant downtown area several blocks south of the sponge docks along Tarpon Avenue for a few blocks east of Pinellas Avenue. 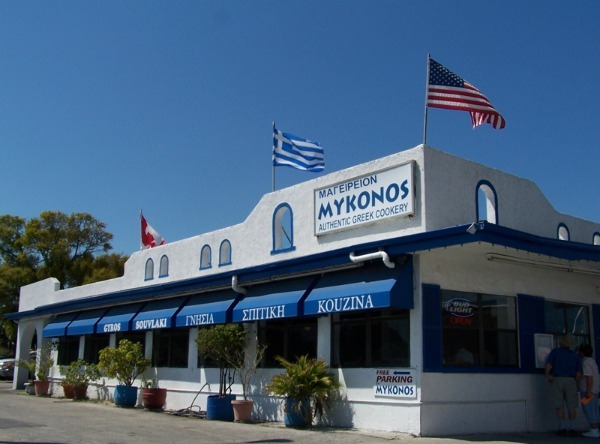 Mykonos is a small Greek restaurant across the street from the sponge docks on Dodecanese Boulevard. The restaurant has its own parking lot and that will save you the typical $5 parking fee that most tourists who visit the busy sponge dock area have to pay. The restaurant is often crowded but don't let that scare you away. The wait is usually reasonably short. The dining room is divided into two areas, one with windows and one without. The room without windows is adjacent to the partially open kitchen and you can see the cooking crew busy at work getting your meal ready. The menu includes the items you expect to see in a Greek restaurant including gyros, stuffed grape leaf, spinach pie, cheese pie, fried calamari, mousaka, keftedes, Greek sausage and many lamb, beef, pork and chicken entrees. If it's Greek, I'm pretty sure you'll find it on the menu. This is not a fancy restaurant and you will not feel out of place in your tourist tee shirt, shorts and flip flops. This is not just a tourist place, however. It's obvious that the locals eat here too. You will hear the customers speaking Greek to the wait staff and the owner. I love a Greek restaurant that Greek people also love. I had beef on my mind when I stopped in for lunch so I ordered keftedes. These are small ground beef and lamb patties or meatballs spiced with pepper, garlic, mint, garlic and onion. I had mine charbroiled and the patties were delicious. The small salad and fresh bread (with butter) served before the main entree were just right and very tasty and fresh. The owner was on hand seating people and chatting with customers. I think he was speaking Greek to some of the customers. At least it was Greek to me. 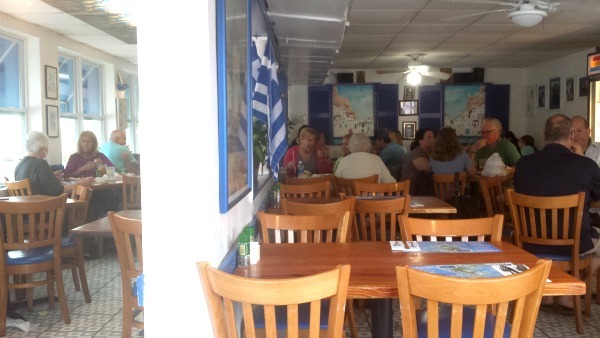 Mykonos is open 7 days a week from 1100 am to 1000 pm. Thanks for continuing to subscribe to Florida Heritage monthly e-zine. 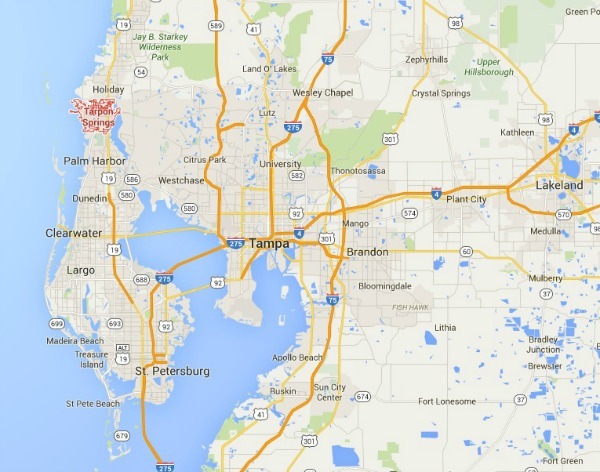 Florida Backroads Travel continues to grow, and we hope you enjoy these updates. You can also subscribe to our Florida Blog by going to our home page and selecting an RSS feed. This way you will have daily updates. This month I added a new page to the website: Mom and Pop Lodging. Now you will know which ones are good to stay at. April is one of the best months in Florida. Usually it's balmy and topical with light breezes and the state is warming up. Windows in cars and homes are open some of the time and heaters don't have to be turned on. The snowbirds are starting to head back north, so the lines are shorter now at our local restaurants.